Molukschen Archipel. Iles Moluques. 28. EENE STRAAT TE AMBOINA. UNE RUE D’AMBOINE. 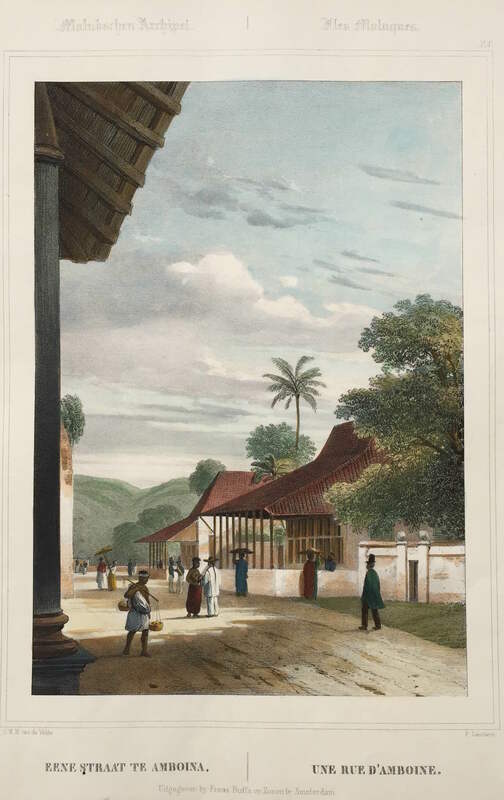 A very fine and detailed black and white mid-19th century lithograph by Paulus Lauters (1806-1875) of a street in Ambon from an original drawing by the C.W.M. Van de Velde (1817-1898), a Dutch naval officer and head of the Dutch Royal Hydrographer’s Office in Batavia and published by Frans Buffa and Sons of Amsterdam in 1844-45 in Gezigten uit Neerlands Indie, naar de natuur geteekend en beschreven, a very beautiful and luxurious illustrated work on Indonesia. The work, which is dedicated to His Royal Highness Prince Hendrick of the Netherlands, contains 50 numbered lithographs of Indonesia including 22 views and plates of Java, one view of the Ampanan Islands east of Java, 2 views of Timor, 10 views of the Moluccas, 7 views of the Celebes, 3 of Borneo, 2 of the Bintang Islands and 3 views of Padang, Sumatra. This is Plate No. 28. Good condition; two small worm holes in lithograph, one in the sky and the other near the top of the pillar on the left and two in the bottom left margin; bottom right-hand margin outside lithograph and cut very close along the bottom edge by the publisher’s note; measures 235 x 332 mm.